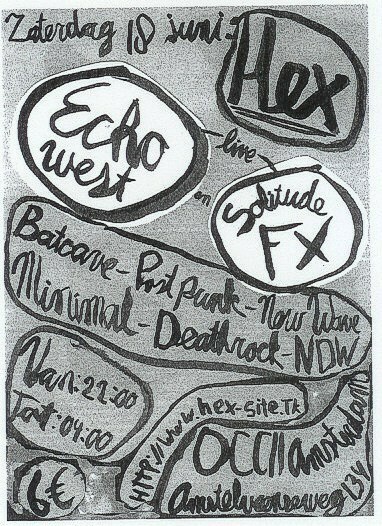 HEX with live: Echo West and Solitude FX. 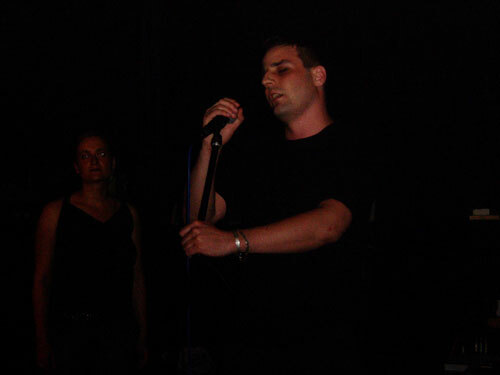 18 June 2005, OCCI, Amsterdam. At the end of 2004 a new party was set up in Amsterdam, entitled HEX, dedicated to oldschool wave, gothic and minimal electronics. A handful of editions have been held until now, which have proved that there is enough interest for this event, which has added something new to the available party landscape. So far various acts have performed at HEX, like Wermut and The Vanishing. 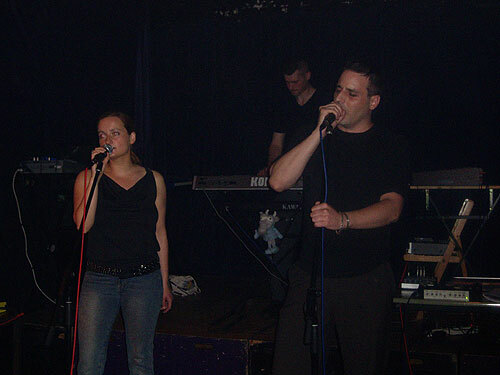 This time they had Echo West as headliner, which I found attractive enough to make my HEX debut, because their latest album “Echoes of the West” has been rotating quite often in my cd-player.The tram brought me quickly from the station to the OCCI near the Vondelpark in Amsterdam. The OCCII is a suitable dark and bare location with a squatting background. The venue was still empty when I arrived at 22:00 hrs., but slowly people trickled in. After being treated to some obscure minimal electro and NDW tunes, Solitude FX took the stage as the first act of the evening. Though not bad, they were not convincing either. This was partly due to technical problems, the sound was not really good. One of the synths also had some hiccups. Furthermore the stage presence of the three members (one synth player, a singer and a female background singer) was very static, it looked a bit like a practise session. Perhaps some smoke and lights could already have worked miracles. The first songs of Solitude FX sounded a bit monotonous, but the second part of the concert was more lively and dynamic, with some songs which showed potential. They had some nice nostalgic synth sounds, but I had to get used to the vocals, which had a lot of reverb, making me think of goth/darkwave acts like Deine Lakaien. Most songs seemed to be quite romantic, which caused connotations with synth acts like Camouflage or Wolfsheim. Towards the end they played some some heavier tunes, like the DAF-tribute which closed the concert. Though Solitude FX still has some work to do, they might be a promise for the future. They have some nice mp3’s on their homepage and a record from them is coming up. Echo West from the German ‘Ruhrgebiet’ really surpassed my expectations. 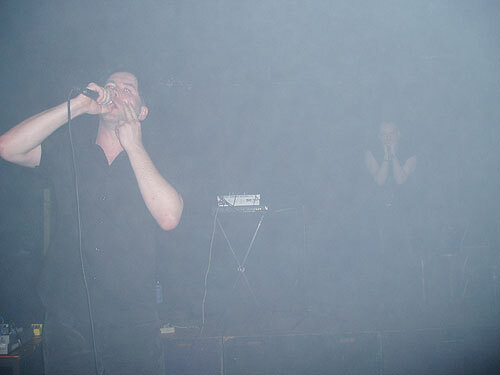 This experienced duo (main composer Dirk Torben Klein has been active in the industrial scene since the mid 80’s, amongst others as Intensive Care Unit) managed to create a cold and dark atmosphere, helped by a real overdose of smoke. Many songs sounded live more powerful and less restrained than on record, like the great song ‘Some thoughts us dead’. Another highlight was ‘ You Want to be Afraid’. 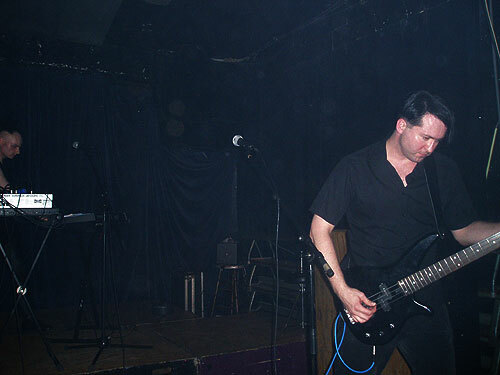 Especially the more melodic, wavy songs of their albums were performed, with quite some material from the latest Echo West album. The stress lay less on noisy experimental pieces, though there were also moments when I had to think of Haus Arafna. Towards the end a few catchy, uptempo pieces were played, I suspect of their Silent Signals side-project. During the concert Adrian K?hler was standing in the back behind his synths, while Dirk was in the front twisting the effects and doing a convincing vocal performance. At the end of the show Dirk also played bass on one song, and Adrian came to the front to do some additional vocals. This show was a great example of how effective minimal electro can be. By the time Echo West was playing, the OCCII had reasonable filled up, with more people arriving after the bands for the afterparty, which had quite a full dancefloor. I must say that the mood at the party was really good, while at the same time having a very underground atmosphere. Personally I found it a pity that a lot of guitar wave/batcave stuff was played after the concert (with excursions to the Cramps, David Bowie and Interpol), I was more in the mood for electronic sounds. Nevertheless I could lose some energy at the dancefloor. Towards at the end some nice electronic tunes (both old 80’s stuff and recent ‘retro’ music) were played, before I had to leave Amsterdam again. While travelling, various songs were still in my head, and I could not stand the fact that their names did not spring to mind. Well, nothing to do than to wait for the playlist.